I Got A Copy Through: I bought it via Audible! There really isn’t much of a difference between reading an e-book and a physical copy, except for the fact that you might not have that gorgeous cover on your shelf. An audiobook, however, is a completely different experience, especially for a speed reader such as myself. And then I had to have eye surgery, and I started looking for my first audiobook on my Audible membership, and there, in my recommended listens was Hidden Huntress, back with Angry Robot. And I simply had to get it. Hidden Huntress picks up a few months after Celine is left in her house, after getting ushered away from Trollus in the dead of the night, in the middle of phase one of the rebellion, is healed and then sent to live out the next part of her life in Triannon with her mother as an Opera Singer, which was the original plan, like everything with the trolls never happened; like all the things that changed her life, and shook her foundations never happened. But Cecile has different reasons for being there – she is going to find Anuskha, kill her and beak the curse that is keeping her beloved and all her friends stuck Under the Mountain, but doing so will also unleash the King, Tristan’s father, his crazy yet supremely powerful younger brother and the rest of Trollus’s ruthless and powerful aristocracy. Breaking the curse means the end of Tristan’s endless torture, but also unleashing on humanity a war they cannot hope to win. 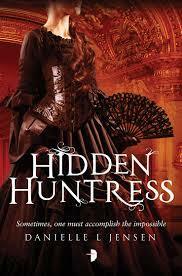 Hidden Huntress. Sigh. What do I say? Thinking about the series in general, I could NOT love it more. I love how it actually had me genuinely believing that what happened to Cecile could happen to anyone at all (being abducted in broad daylight by someone you thought you knew, taken to a city under a mountain held up be a magical tree, and being bonded to a prince of a species that you only heard about in the tales meant to scare you.) (Yes, SERIOUSLY.) I love how Cecile and Tristan worked together as a couple so perfectly. I loved LOVED LOVED LOVED LOVED Tristan. I cannot even say how much. I just LOVED LOVED LOVED LOVED him. Really looking into Hidden Huntress, however, I find that while I still loved that world, the characters and everything about it, I feel like it could have been better. Cecile, herself, could have been more. I guess she was my biggest disappointment. From being the badass, sarcastic, rebellion planning, magic using human that got a troll prince to fall in love with her she was reduced to the whimpering mess that pretty much every Disney Princess turns into once they’ve found their one true love. Don’t get me wrong, she was still doing things like looking for Anushka, but I didn’t like what being separated from her one true love did to her. I really don’t have anything to say except I have a serious soft spot for the series, and I’m still in love with everything about it, and I can’t wait for May to come, just so that I get my hands on the conclusion. If you haven’t read either, then I strongly recommend that you wait for book three and read them as a complete series, because then you won’t have to feel emotional turmoil. Or, you know, since I’m never one to follow my own advice, shout ‘BOOKS’ and dole out a bit more money from your always-getting—lighter wallet and delve into a series that will make you swoon!